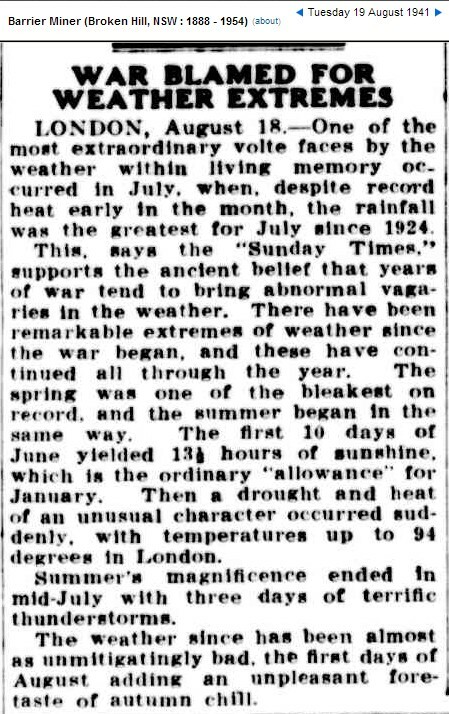 Climate experts tell us that climate change causes war, but in 1941 climate change was caused by war. This is a positive feedback loop which causes some well knowing climate scientists to behave like escalating douche bags – until their funding gets cut off. Makes as much sense as a political movement blaming a trace gas for all the evil in the world and making videos depicting unpleasant death to all who simply find the concept unbelievable. But it wasn’t CO2 warming, but smoke from bombing and burning, SO2 aerosol etc, which would tend to cool things?